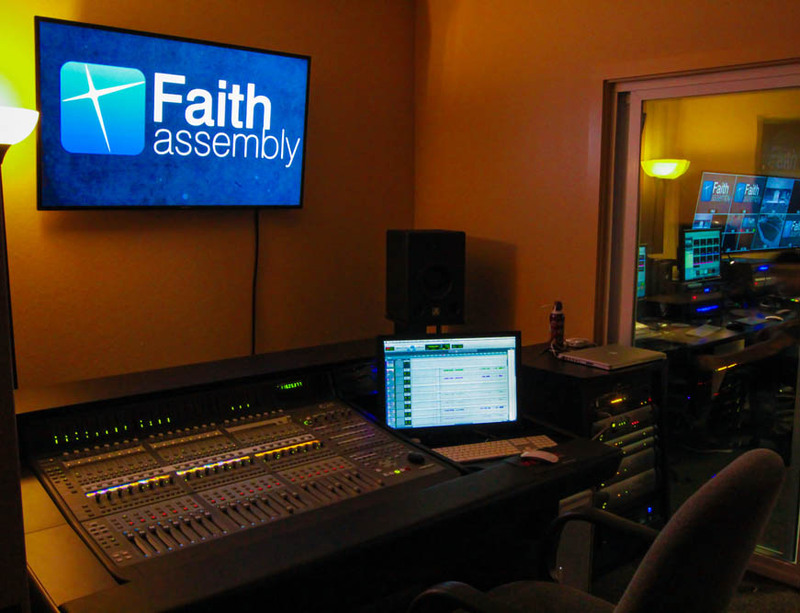 When you walk around the 300,000 sq ft. mega Faith Assembly of God church you feel the audio visual impact. 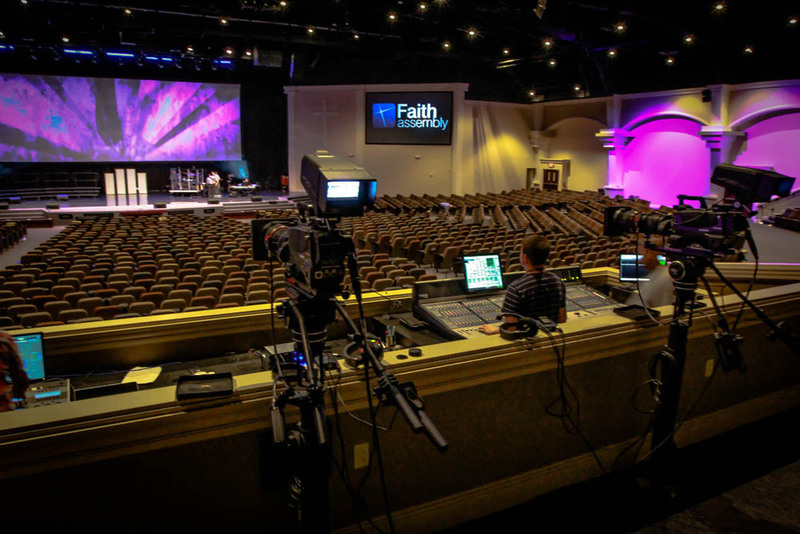 Encore Broadcast Solutions was a core team member for this multi-million dollar audio, video and lighting system to make the brand new complex technologically savvy but still budget friendly. The complex boasts almost 3,000 stadium-style seats within the sanctuary, three children’s theaters, a wedding chapel, choir room and atrium. Each venue features full audio, video and lighting capabilities, and the entire complex is completely integrated with HD/SDI capability. The design process took multiple meetings with client, general contractor, electrical engineering with several equipment list revisions and a detail documentation in AutoCAD. The installation process took several months with a combined crew of 12 technicians and engineers working in conjuction with a general contractor. For the sanctuary the video equipment includes an all-encompassing 60’ wide by 20’ tall screen in the center stage for graphics, lyrics and video display. This is illuminated by two sets of double-stacked DPI 16,000 lumen TITAN Quad projectors. There are left and right flanking 21’ wide by 12’ tall screens that display content from a video mix of Hitachi HDTV studio field production cameras. The video signal to the six projectors is sent via single mode fiber optic cables and converted to HD-SDI for direct distribution to the projector’s input card. An Analog Way DVX8044 Di-VentiX switcher/scaler manages the image blend as the four TITAN Quads are installed in a fully-aligned motorized truss that is attached to the building’s substantial steel structure. 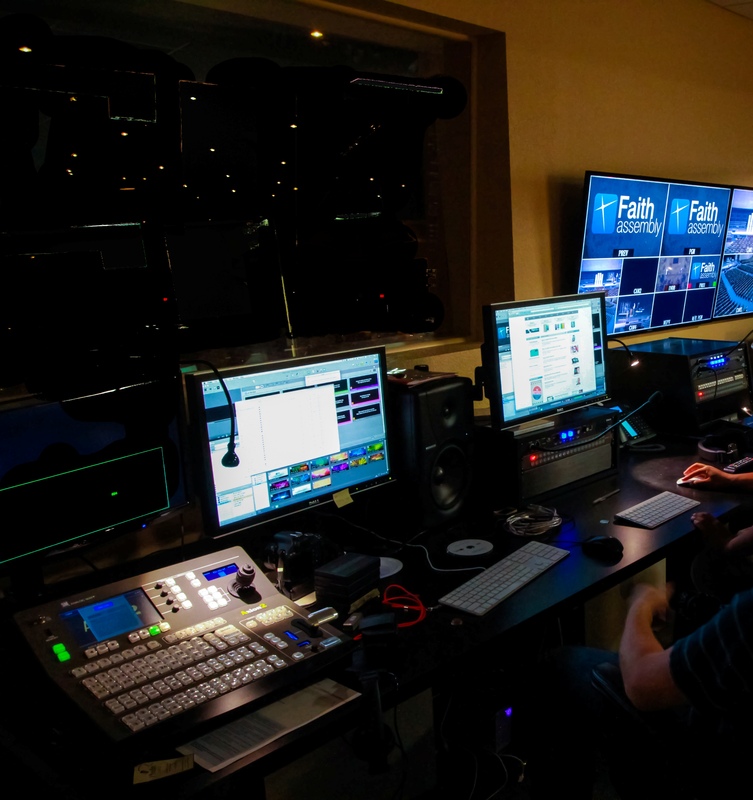 In the control room a For-A HD video switcher, For-A dual channel frame sync, Blackmagic 40x40 router, four AJA Ki Pro, two JVC Blu-ray recorders and HD streaming encoder allows the team to produce live programming for local and internet viewers. Also, a fiber grid allows the team to send and receive audio and video signals to the atrium LED wall and audio PA system for overflow purposes. 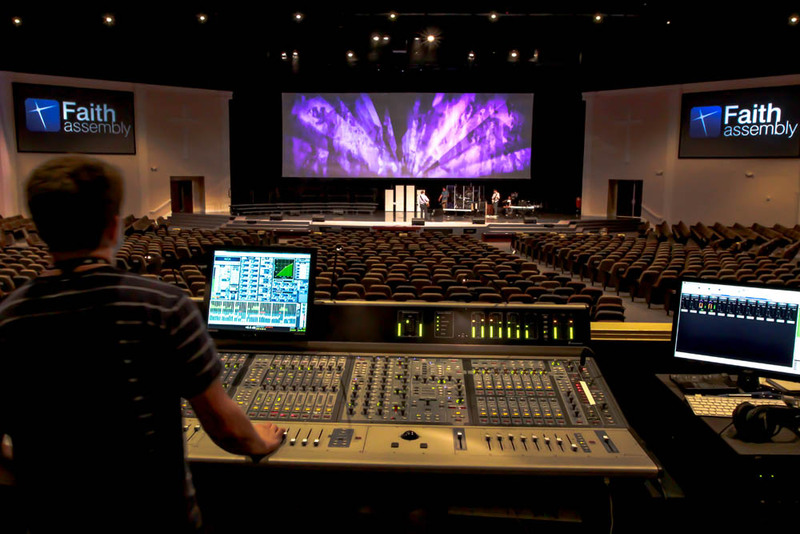 The audio equipment in the sanctuary consists of a Digidesign (Avid D Venue) 64 audio console with 12 Shure wireless microphones and a Turbosound PA system. This system includes TCS-1061 line array speakers, NuQ-6 and NuQ-8 ultra-compact passive loudspeaker system for front and side fills, TSW-218 subwoofers and TFA-600L flown subs that all allow the team to reproduce accurate sound mix and well distributed sound quality to the attendees. For the steaming and recorded audio program the main Avid D Venue console communicates via MADI to a Digidesign SC48 with expanded card for up to 64 channels of audio for independent recordings. Pro Tools HD is in the mix for final audio production. More than 14 single-chip and 3-chip DPI projectors such as the E-Vision 6000 and M-Vision 400 are used throughout the childrens’ theaters, classrooms, boardrooms, cafeteria and on-site wedding chapel. 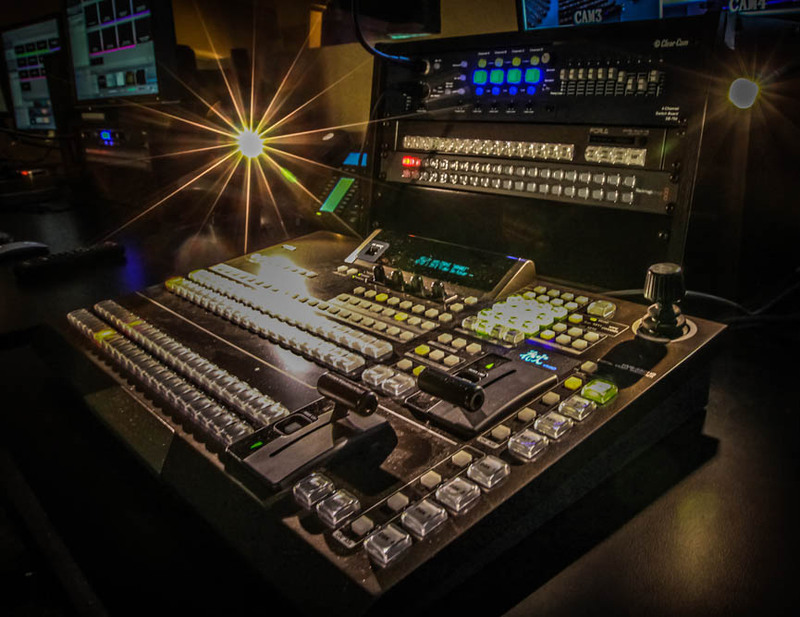 Other various equipment installed throughout the campus are Turbosound speakers, amps, subwoofers, Pan/Tilt/Zoom cameras, HD video switcher, AJA KI-Pro recorders and intercom system. All equipment is utilized to enhance and support live performance and deliver content on demand. For the lighting design across the complex Encore used Elation Opti Par, discharge moving heads, local dimmers, DMX control and a Jands Vista console to provide the best solution to create, enhance and deliver lighting effects for any particular production or event. Encore’s electrical design allowed ultimate flexibilty for dimmer location and the lighting’s extensive distribution. 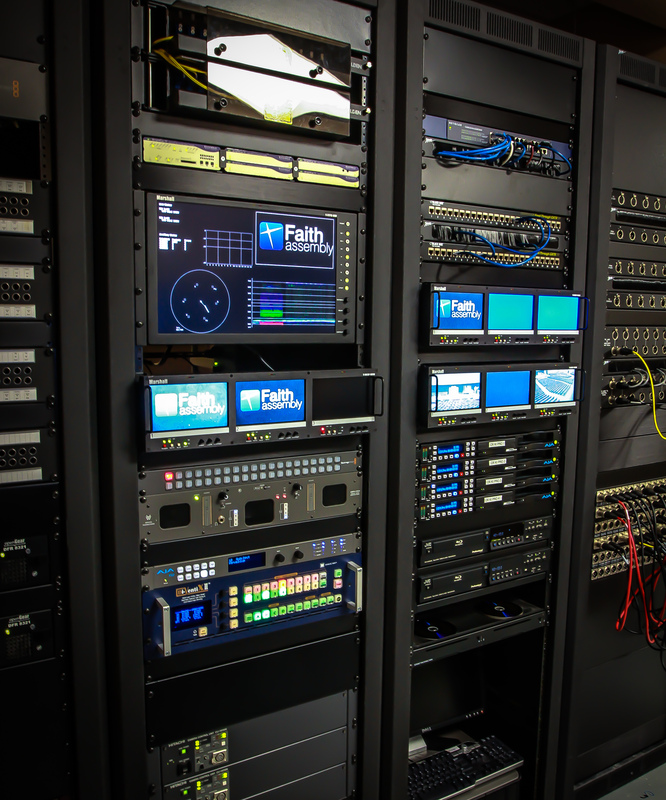 The sanctuary infrastructure has several floor and wall pockets installed with audio, video and data terminals for complete flexibility when interconnectivity is needed for special events and daily/weekly programming. The entire complex can share any audio visual device from one venue to the other thanks to the patching and fiber structure design. Faith Assembly of God’s vision is to reach people and build lives. Encore’s successful contribution has helped in that process by creating a state-of-the-art technological impact through audio visual means. 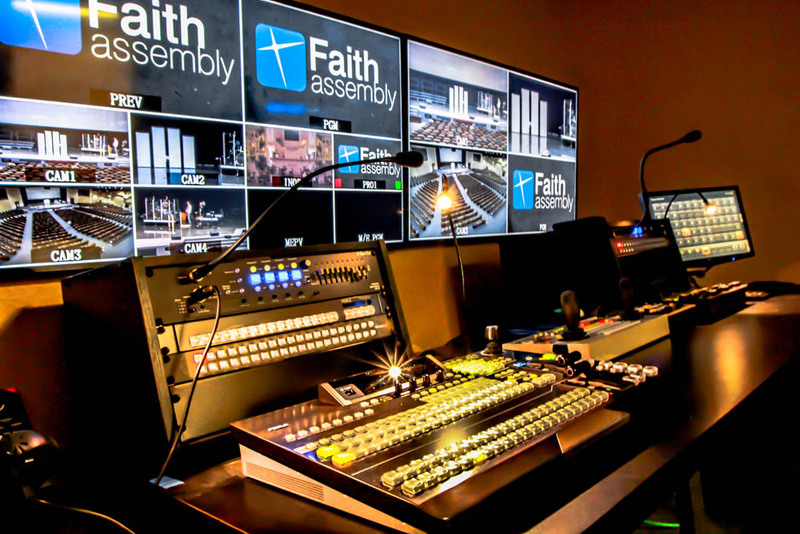 While serving as the Executive Pastor for Faith Assembly of God in Orlando I was responsible for the construction of the church’s $28 million new facilities on Curry Ford Road. I chose Encore Broadcast as our media integrator. They worked with me to design an extraordinary multi-venue integrated system that was economical, but very powerful. The quality and performance of the installation met or exceeded expectations. The work was completed in a timely manner and at or near budget. I not only recommend Encore, but continue to use their services.